About two years ago, Brian and I were back in my home town and decided that we’d make an impromptu stop at Michael Symon’s restaurant, Bar Symon. We had heard rave reviews from family and friends about both the atmosphere and the food. Of course, I fell in love with the place immediately. The restaurant was situated in a shopping center in Avon, Ohio. It was a quaint space with masculine, gray toned decor, a flying pig logo and a perfect bar full of an incredible selection of beer. The menu was simplistic and full of Michael Symon staples like pierogies and pork. 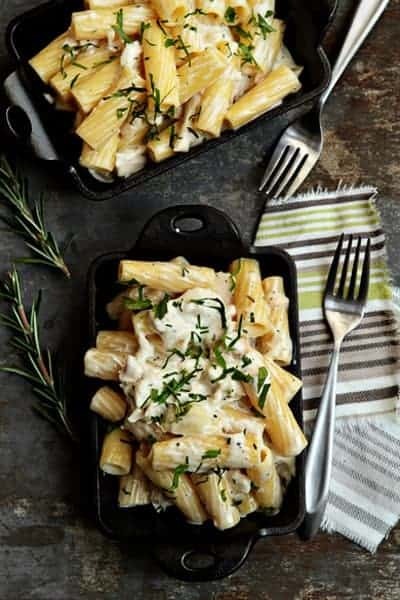 Since our first visit, we dined there numerous times and although everything was beautiful and more importantly delicious, nothing stood out in my mind like their Mac and Cheese with Roasted Chicken, Goat Cheese and Rosemary. 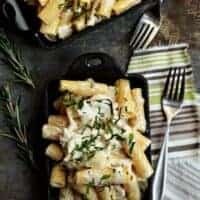 The Mac and Cheese was creamy, tangy and perfectly infused with fresh rosemary. The roasted chicken made it hearty and “manly” enough for Brian to accept as a main course. It’s one of those dishes that forces you to instinctively close your eyes and truly enjoy what is dancing around in your mouth. It was love at first bite and I knew I had to find a way to replicate it at home. You can probably imagine how jazzed I was when I discovered that the recipe was from Symon’s book, Live to Cook. I must say that I was pretty amazed that such a gorgeous plate of food consisted of such a short list of ingredients. And the ingredients are not the only thing that’s simple about this recipe – the prep work is also a breeze. I used leftover roasted chicken from the night before, but you can make it even more simplistic by picking up a rotisserie chicken from your local market. Although I was pretty upset when I learned that Bar Symon was closing its doors last fall, I’ll remember it for turning me on to one of the most delectable mac and cheese recipes that I’ve ever eaten and will be forever replicating in my own kitchen. I hope you’ll join Katie and I this week and share your favorite recipe that uses fresh herbs for our Shenandoah Growers Organic Fresh Herbs Holiday Recipe Exchange. Shenandoah Growers offer high-quality, organic, fresh herbs that are perfect for all of your Holiday recipes. You can connect with Shenandoah Growers on Facebook and Twitter for product information and delicious recipes. Head on over to Good Life Eats and check out Katie’s recipe for Fresh Herb and Citrus Turkey Brine. 2. While you are waiting for the water to boil, pour the cream into a large sauce pan over medium heat. Add the rosemary and garlic to the cream and bring it to a simmer - take care not to let it boil over. Allow the cream to reduce by about half. 3. Stir in the goat cheese and chicken and continue cooking cooking it till the cream coats the back of a spoon. 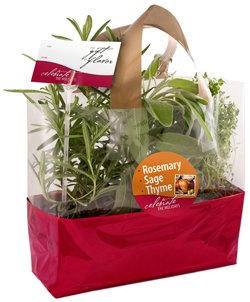 Shenandoah Growers even has holiday trio packs that include living organic Rosemary, Thyme, and Sage, so they’re perfect for holiday cooking. Festively wrapped with an elegant holiday greeting card, they also make an excellent hostess gift. Look for the Holiday Trio Pack in your local supermarket. Write and post a recipe on your blog featuring FRESH HERBS. Include “Come join the fun at the My Baking Addiction and GoodLife Eats Holiday Recipe Swap sponsored by Shenandoah Growers Organic Fresh Herbs.” in your blog post. Submit your post before Nov. 14, 11:59 PM.